So they closed comments on John Stembergers article....he said this..
"Parents should have the e xclusive right to raise issues about s e x and se xuality with their children in their own time and in their own way, in the privacy of their homes, not brought up by other older boys around a campfire. Allowing open hom os e x uality injects a sensitive and highly charged political issue into the heart of the BSA, against the wishes of the vast majority of parents." Okay so he removed his children from the campfire to avoid the older kids......does he home school his kids? What happens when they go to school. Also a vast majority in the South were against blacks getting rights. Sounds like the BSA will be better off with one less big ot. "The BSA had never discriminated against homosexuals. " "...we do not grant membership to individuals who are open or avowed homosexuals...."
It is a sinful lifestyle and has no place in our great country. I didn't realize that atheists insist on having equal access to heaven. Not sure how to solve that one...? @ryan, i don't think they do. i think the church is trying to broaden its base by being more inclusive. Why then are they concerned with Catholic doctrine regarding salvation? @Ryan: a sting! Touche! Unless of course there is a reason for concern outside the scope of your imagination. For example, I am concerned only insofar as it is fun to ridicule the aforementioned doctrine. Others will have their own reason. Here are some hints: political power of the church, wishing to know what our neighbors believe; you could come up with more if you wanted to. Hallelajah! I'm being admitted to a non-existent place by a non-existent god. Too bad my "soul" won't exist after I die to enjoy paradise. Nice of him to say that, but I think the chance of there being a heaven is along the same line of me winning the power ball lottery. "... along the same line of me winning the power ball lottery [without buying a ticket]"
Nah... Because you actually have a chance to win the Powerball. Reading the remarks from the devout people on here is truly disheartening. It amazes me that you find such discomfort in the allowing of 'certain' people into Heaven, which tells me (based on the faith and your comments) that you find comfort in damning people to Hell. Concerning your belief, what benefit will you gain when you are in Heaven and 'Jim' or 'Sheila' is not there? Your selfish soul will be proudly celebrating the eternal pain of another. Somehow I feel your faithful condescension is not exactly a ticket into Heaven. Then again, I probably just missed the part where the purpose of religion was to persecute others. From the beliefs I have heard about Heaven, I am fairly sure "riff-raff" is not a problem in Heaven. Not damning people but speaking what is said in the Holy Word. Jesus stated that the only way to the father is thru him, that means believing in him. Now based upon their belief of not believing, who is damning them? Themselves as I see it by their own admittance. Yes all are redeemable and no one is to be treated any different then others, but one can not gain admittance to Heaven unless one believes and live by the example of Jesus Christ. Even self proclaimed Christians will not see heaven if they do not truly believe deep in their Heart that Jesus is the Son of God, and came to die for not just a specific people's sins but the sins of the World, Opening the door to Heaven to all because we all fall short. So what The Pope is saying, is not completely true/false, but he is playing the middle of the road. And God Gave us the choice to believe thus either saving ourselves by believing and living on Jesus' words or denying them and his existence. Also He said All who deny him while here on Earth he will deny before his father and state I Know thee not depart from me. So the choice of being saved or damned is your choice. No man outside of yourself can put u in heaven or hell, but your belief or non belief of the son and the father. I believe and will live by that belief, but will share my belief to all that want to hear, but those that choose not to hear I pray for redemption not damnation. Heaven for atheists? Popeye say yes! Aah ga, ga, ga, ga! 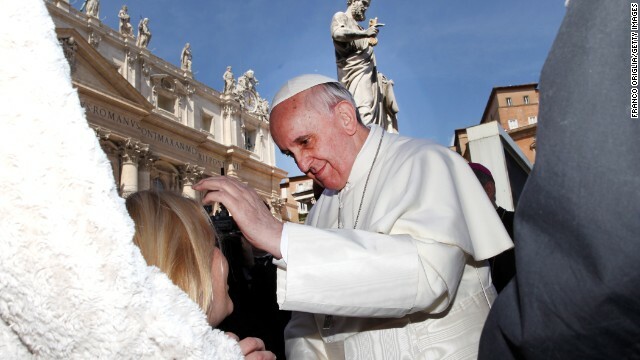 "bishops and experts in Catholicism say Francis was expressing a core tenant of the faith." These comments are absolutely blasphemous. Irregardless of how you believe or what your thoughts are, if the doctrine that you base your beliefs on is changed simply to fit in with what the world wants, then you have been blasphemous to said doctrine. The Pope is playing God here by changing the words of the bible. Let it be clear... Jesus was clear that the only way to salvation was belief in him. It has nothing to do with being good or bad. Jesus said, only a fool in his heart has said that there is no God (an atheist) he admonished such a belief as the pathway to hell. Whether you like it or not... one cannot change the very words that Christ spoke. What the pope did was simply a part of a greater expanding apostasy to please the majority. The very teachings of Jesus show that, as God in the flesh, he did not waver from the truth.. whether people liked it or not. Considering what Jesus said was written at least 60-100 yars after his death at the very minimum, I don't think you can take the Bible as direct quotes anyway. It was written by men to further whatever agenda they were pushing at the time. the story of jesus is either a complete work of fiction or so grossly embellished as to be meaningless. Tony– The Catholics and protestants both see eye to eye (typically) that Christ's sacrifice was to "redeem" the sins of all. Christ, in one instant, gave his life so that ALL mankind from all time would be delivered from sin. Redemption is not equivalent to salvation. According to the Doctrine of Papal Infallibility, if the Pope says it, it's true. Ergo, it takes precedence over your interpretation of the gospels. It's fun to make up things that can never be proven or disproven. Pope Francis stated something that the Catholic Church has always taught; that Christ died on the cross to deliver man from sin. This "deliverance,", or "redemption" includes the totality of humanity for all time (even atheists). Redemption, however, should not be confused with salvation. That is another subject altogether. God Himself is the judge who determines which souls are granted salvation and which are not. For Catholics, salvation is promised for those who live their lives in communion with Christ. For non-Catholics, salvation is available for those who, according to God's judgment, live in accordance with their conscience that is "written on their heart." It is interesting to see that even the Pope has spin-doctors to 'refine' what he stated. Pretty much what the Bible says–Christ's death on the cross was for everyone. Period. Now, whether folks avail themselves of that becomes the question... To paraphrase, whosoever believes shall not perish... The onus is still on the individual to accept that redemption. And recognize, all have sinned and fallen short...—it’s only thru Christ’s redemption that we can reach salvation, not thru good works. The idea that you "go" to heaven or hell is silly. When you die you don't "go" anywhere. Rather you become what you were for the billon of years before you were born. A peaceful nothingness. In 1700 none ofus existed and was it not a rough time for you. We won't exist in a hundred years from now. Only a body is born; only the body dies. not a soul. The soul is eternal having existed for all time. Hate to tell you that. Obviously you think you're special and people you disagree with deserve to suffer eternally based on some fairy tale book you blindly put your faith in. There is confusion between "redemption" and "salvation". Catholics believe Jesus died to redeem every human, good, bad, catholic, protestant, athiest, pagan, murderer, shoe salesman, saint, scientist, straight, gay, wise or foolish person that has ever lived or will ever live. A person can either accept that redemption or reject it. We belive that the ultimate wages of that rejection is the eternal seperation from God which is called Hell. Just because a person does not accept Jesus as his or her savior does not prevent them from being redeemed or from doing good on this earth as all of us should. Definitely a misleading interpretation on CNN's main page. Like anything else a religious leader says, his comments are totally irrelevant to the real world. If you are naive enough to dismiss the fact that religion is part of the "real world" then you live in a fairy tale. Ignorance is bliss I suppose. I like this, 15554 commits 0 Facebook recommend 0 tweets 0 unshared and 0 Google. Fail for the pope! I am a religious person, but not a Catholic. I think the Pope's statement is tremendously important. He is emphasizing living a good life, and being kind to other humans, and discouraging us from using our religions to (erroneously) judge whether our fellow man might or might not go to "hell" , and to also discourage us from fighting and persecuting each other based on religious differences. I don't agree with the President of the American Atheists that Jesus said blaphemers would go to hell - Jesus died on the cross with two thieves and emphasized that believers could go to heaven. Jesus also emphasized the Golden Rule. I don't recall Jesus every saying anyone would go to Hell, except those who stole from others, etc. and were unrepentant for what they had done. "Although the pope's comments about salvation surprised some, bishops and experts in Catholicism say Francis was expressing a core tenant of the faith". Um, is a "core tenant" someone who rents a core? Yes, I think the word they were looking for is "tenet." Meaning "specific belief."